Keeping track of two children under the age of three has made Anna Zasada acutely aware of how difficult it can be to incorporate children into the everyday routine of gathering, preparing and serving a meal. Next week, Zasada and her sister, Emily Rehberger, will take a bit of that pressure off parents when they lead two “Junior Chef Farm to Table” cooking classes at Savory Spoon Cooking School in Ellison Bay. The classes mark the third summer of collaboration between Savory Spoon and Hidden Acres Farm, a Northern Door produce farm and community garden owned and operated by Zasada and Rehberger’s parents, Tom and Carolyn Rehberger. The sisters will draw on their family’s interest in the farm-to-table movement (Hidden Acres Farm supplies produce to several local eateries, including Wickman House, Base Camp, Whistling Swan and Roots Inn & Kitchen, among others) and their personal experiences working with students to craft classes that will give children the confidence to use their newfound skills in their home kitchen. Zasada has worked with children as an elementary school teacher in the Chicago suburbs, while Rehberger works as a garden teacher with Edible Schoolyard NYC. Through her work with Edible Schoolyard NYC, Rehberger has learned how to safely incorporate children into the kitchen (replacing a knife with scissors for young children, for example), and how to stylize lessons to include traditional school subjects. While they draw on locally available produce to design their menu and tend to focus on American kid classics like last year’s pasta and marinara class, this year the sisters decided to add a unique cultural twist that will bring children beyond the standards they may be used to. Children in the field at the school. Photo courtesy of Savory Spoon. “Junior Chef Farm to Table 1” is Aug. 14, 9:30 am – 12 pm. The menu includes: Carrot Hummus, Naan Bread, Handmade Falafel, and Chocolate Cardamom Cake. “Junior Chef Farm to Table 2” is Aug. 15, 9:30 am – 12 pm. The class has an Iranian theme with the following menu: Garden Art at Hidden Acres; Tah Dig (Crispy Rice); Zucchini Kuku; and Spiced Yogurt with Summer Berries. 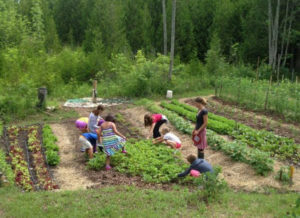 Both classes start at Hidden Acres Farm on Beach Road in Sister Bay and then move to the cooking school to prepare and enjoy a meal with the freshly picked produce. Students will receive hands-on instruction in organic farming, basic knife skills and cooking techniques. The kids’ classes cost $55 each.